Product #552 | SKU DV/RESSTUD | 5.0 (based on 1 rating) Thanks for your rating! Revolutionary tools for editing, colour correction, audio post and now visual effects, all in a single application! DaVinci Resolve is the world’s first solution that combines professional offline and online editing, color correction, audio post production and now visual effects all in one software tool! You get unlimited creative flexibility because DaVinci Resolve makes it easy for individual artists to explore different toolsets. It also lets you collaborate and bring people with different creative talents together. With a single click, you can instantly move between editing, color, effects, and audio. Plus, you never have to export or translate files between separate software tools because, with DaVinci Resolve, everything is in the same software application! 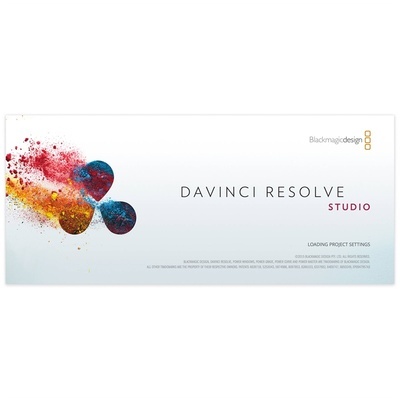 DaVinci Resolve is the only post production software designed for true collaboration. Multiple editors, assistants, colorists, VFX artists and sound designers can all work on the same project at the same time! Whether you’re an individual artist, or part of a larger collaborative team, it’s easy to see why DaVinci Resolve is the standard for high end post production and is used for finishing more Hollywood feature films, episodic television programing and TV commercials than any other software. DaVinci Resolve now has full Fusion visual effects and motion graphics built in! The Fusion page gives you a complete 3D workspace with over 250 tools for compositing, vector paint, keying, rotoscoping, text animation, tracking, stabilization, particles and more. With new Apple Metal and CUDA GPU processing, the Fusion page is faster than ever! Fairlight audio gets a massive upgrade with new ADR tools, audio normalization, 3D panners, audio and video scrollers, a sound library database, and built in cross platform plug-ins such as reverb, hum removal, vocal channel and de-esser. There are also dozens of new features and improvements that editors and colorists have asked for. These include a new LUT browser, shared grades, multiple playheads, Super Scale HD to 8K up-rezzing, stacked timelines, on-screen annotations, subtitle and closed captioning tools, better keyboard customization, new title templates and much more! Resolve is the future! Buy once and you've got it forever, no subscriptions, old school styles. If you're on a mac then get it through a reseller like Rubbermonkey and not the app store. I was advised to do so by Blackmagic, supposedly the app store version is slightly different, lacking some features or options I believe.